Easter Week-end is always a great time to go cherry blossom viewing in Vancouver. The Akebono cherry trees are in bloom and looking spectacular. There are lots of buds in the Downtown trees, which means you still have time to visit. They should be in full bloom within 2-3 days. 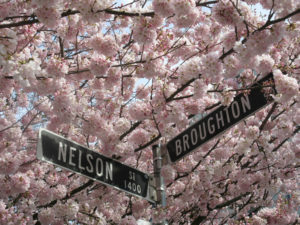 Attend one of the Vancouver Cherry Blossom Festival’s Tree Talks and Walks to learn more about cherry trees.